The purchasing power of the US Dollar is being destroyed. Savers and wage earners work harder and harder and fall farther and farther behind. The official unemployment and inflation statistics are wrong. Debt with interest is an exponential function. Are we being set up to fail? This is the story of my journey as I discovered that what the government, higher education, media, and the financial industry was telling me about investments and economics was WRONG. The calculations they use don’t work. In 2004, I got the feeling that something wasn’t right. I had not recovered my 401k losses from the 2001 crash. I was frustrated that I paid someone fees every year to lose my money (I figured I could do that by myself for free). My income was rising, but even though I had no new bills, my income was quickly closing in on my expenses. I did some research on the last decade of my bills and realized that they had quintupled in price, even though I lived in the same house and drove the same distance to work. I started realizing that even if my living expenses just doubled every ten years, I would be hard-pressed to find an investment that would keep up long-term after taxes. I started questioning whether I could actually retire in 20 years like I wanted to. How could I sustain my savings enough after retirement when I wasn’t adding to it every year? The calculations weren’t working. I figured there had to be a better way. I set out to find it. Later that year, I discovered the first calculation that didn’t work: the purchasing power of the dollar. Most people assume that higher living expenses are solely the result of inflation in prices as a result of increased demand. That can be the case. But in a fiat money system, prices can rise because the currency that they are valued in is actually losing purchasing power. That can be called inflation or it can be called the devaluation of the currency. The US Dollar has been slowly losing purchasing power since 1913, but it has been losing a lot of purchasing power since 2001. In fact it has lost 35.5% since 2001, when it traded above 1.21 and today is trading around .78. Link to chart. Play around with the historical data. It is enlightening. That means that my investments would have to appreciate at least 35.5% just to stay even. More after taxes are factored in. So my next question was: can stock investments make up for the short-fall in the currency? I discovered the inflation-adjusted DOW chart. This chart was a big revelation for me. I realized that even though the DOW had reached a high in 2007 in dollars, it actually had been in a down-trend cycle since 1999! So, if I had my money in stocks since 1999, I was fighting a down-trend cycle. From 1999 to 2007 (and we all know what happened after 2007), it was a just big U on the chart. I was strictly treading water even if my investments were good and meeting the market. Disclaimer: yes, you can earn money in stocks in a down market, but you have to pay very close attention on a weekly, sometimes daily, basis to your investments. You also need a formula that well exceeds the median market price and follow it to the letter over a long period of time. I don’t have that kind of time or interest right now. If you do, more power to you. And if I had just cash sitting the bank CD or maybe a money market fund earning 2-5%, I was actually losing at least 30% after taxes. Yikes! I learned that fiat currency can work for you or against you. I want it to work for me, like a surfer on a big wave. Less work, more fun. So, the discovery of the loss of purchasing power brought me to another calculation that didn’t work: the official inflation rate. During the period that my bills were rising exponentially and the dollar was deflating, the US official inflation rate didn’t go over 4% per year. How could this be? The numbers weren’t adding up correctly at all. John Williams of shadowstats.com figures the inflation rate as one would before the government changed the formulas for calculating the CPI or what is known as the official inflation rate. I hear you saying, “They changed the formula?” Yes, twice, in the last 30 years. If you use the CPI index government formula prior to 1980, the current annual inflation rate would be a little over 10%. Link to charts: 1980-version is the second chart. The official inflation rate is 3%. Finally, I understood why I was fighting a losing battle between my income and expenses. My income didn’t go up 10% per year and I didn’t see that happening in the near future. Check out the rest of John’s website, the government jacked with the unemployment formula, as well. Hint: it is not under 9%. To review. Think of the loss of purchasing power of the dollar as affecting the amount of “stuff” your income can buy. And think of the real inflation rate as the rise in cost of that stuff. A part of these economic factors overlaps, but some of it just puts financial pressure on Americans from both angles. Debt is the next calculation that isn’t working. There is more and more debt. In fact, in some investments, such as the US housing market, investments reached a tipping point in 2007 where the underlying asset was not worth enough to cover the debt. This is a balance sheet problem where the assets are worth less than the debts. As soon as home-owners missed mortgage payments or defaulted on their loans, the entities that held these loans (or a derivative of these loans) loss the income from the interest. Now, the income statement is effected. Less income means banks can’t meet their debt obligations. Now, we have a major system-wide solvency problem requiring government bailouts and interventions. Because the US housing market runs on mortgage-creation and little debt is available from a very-stressed banking system, we can conclude that housing has much further to fall. Keep this in mind if you are planning on building, buying or selling a house in the next 20 years. Think about how you can invest in homes and systems to break even on living expenses or create passive income, not create capital gains when you sell. But it isn’t just mortgages and banks. Here is a list of some other debt issues. Global paper investments are 100 to 1000 times the underlying asset. This must contract. The European debt crisis is similar to scale of the US Housing Market collapse in 2008. Requiring trillions in bailout funds just to keep it from collapsing. A slowing global economy freezes new debt creation. No new debt means the paper investments must contract to a level appropriate for the underlying asset and the lower economic level. The banks will not give up their paper assets, they will not take a loss or they will have to admit that they are bankrupt. Governments can only buy so many paper investments as they are trying to peddle their own debt. MF Global bankruptcy is the blue print for how banks will be first and pension funds, hedge funds, and investors will be last, when the paper investments DISAPPEAR. Current investors do not understand this change in paper investment risk, because as long as they have lived, paper investments have gone up, because new debt has always been created. That is no longer the case. The entire global economy as a system not only leveraged on debt but it is sustained by debt. It doesn’t just need debt for growth. Any hope for real growth is long gone. Any loss of credit availability anywhere on the globe and the system starts to collapse like a house of cards. Globalization has a darker side. Many people believe we can meet our present and future debt obligations by taxing more and shrinking government. Aside from the fact that the devaluation of the US dollar is already an invisible 35% tax on everyone, who are we going to tax more? Of the 310 million people in the US, only 65 million actually produce an income separate from recycled government money programs (that’s about 20%). How can 20% of the population support the other 80%? They can’t, we have been selling US debt to investors for cash to cover the short fall for years. So, let’s raise taxes on the rich, and sales taxes, income taxes on everyone. Third, unemployment (and underemployment) will continue to rise whether the government formally admits it or not. Unemployed people do not pay taxes and they don’t buy stuff. Fourth, at some point, the IRS will turn its focus to corporate taxes and payroll taxes. This will produce two things, more jobs move overseas and fewer jobs for US citizens. Even if the US announces some incentive for companies to keep jobs in the US, it will be a net effect at best. Government incentives go to pay higher payroll taxes for existing (not new) employees. That process is a circular flow of government money, not actual new taxes. Fifth, any new taxes on middle class or lower classes will only lower national GDP as it currently consists of 70% consumer spending. People who pay more taxes, spend less on consumables. Sixth, government as a whole must contract, it is unsustainable. Government employees will be laid off. Seventh, an aging population doesn’t work; they don’t have an opportunity to earn “extra” money. Underemployed people do not pay taxes and they don’t buy more stuff. Higher taxes will not work. Shrinking government will help expenses, but it will also have the consequence of putting more people out of work. Shrinking government money programs will help with expenses, but it will also put more stresses on those relying on government money. Right now, that’s a whopping 40% of the population. Part of the reason that the government likes a lower US dollar is because it allows them to pay old debt obligations back at a lower price in present dollars. But that little game, started aggressively in 2000, is coming to an end. More and more of the debt borrowed is just to pay interest on the outstanding debt. It isn’t even used for running government programs, we borrow more for that. Sovereign debt investors understand this exponential function and its endgame. At some point, there will be a no-bid US bond auction. The US government must “default” (though it will never be called a default) on at least part of its debt at some point in the future. This will severely limit its ability to obtain new debt for normal government business. This is just what is happening to Greece right now. For more information on how US debt affects the cost of energy and the economy and how the exponential function (or hockey stick) works against us, Chris Martenson has an excellent 45-min video called The Crash Course on the subject. Thus, by “default”, taxes will rise and government will shrink one way or another in the future. By this time, you probably want me to change my name to gloomygirlfriday. Stay with me. Relax, these are scary facts about the bleakness ahead, but it is all just a cycle. A contraction of the global debt cycle. You have no control over this cycle, so it does little to worry about it. Acknowledge, yes. Worry, no. This has happened before; people lived though it, you will too. But when you experience a collapse in debt and the value of fiat currency, you also have a gain somewhere else. The capital that is left moves from risky debt-related investments to lower risk tangible investments. When a wave of capital starts to move, you experience a long-term investment cycle. You do not have to be a financial genius to keep and earn money in a long-term business cycle. In 2005, I started looking at different business investment cycles. I was looking for an investment cycle that could keep the purchasing power of my original investment for a period of years. Gold gained 64% during the same period I analyzed earlier (1999-2007). Link to gold chart. It was keeping and exceeding the loss of purchasing power of the currency it was denominated in. I realized that we were in a long-term bull uptrend in precious metals. At last, a calculation that worked! In 2005, I started buying to catch as much of the wave as possible. Precious metal cycles tend to last 15-20 years. So, if it started in 2001, it will last anywhere from 2016 to 2021. Yes, this cycle will end too, but there will be another one to take its place. 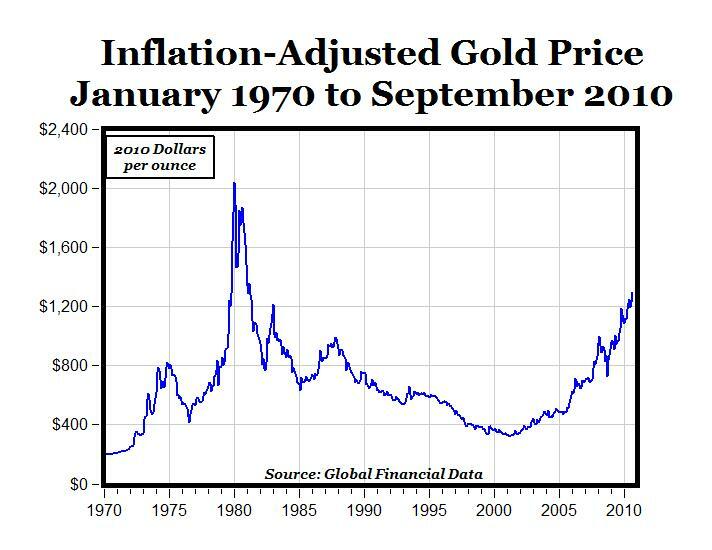 One way to tell where we are in the precious metals cycle is to look at an inflation-adjusted gold chart. This one goes back to the last gold bull cycle in the 1970’s-80s. Link to chart. Fortunately, the inflation-adjusted price of gold is constantly changing as the powers-that-be create more and more debt to try and fight the collapse. Some of the new debt goes into real things, like physical gold and silver, and they become more valuable. The chart above uses the official-inflation rate to chart gold. But wait a minute, as we learned from John Williams, they changed the formula, twice. The good news is if we use the pre-1980 formula, the inflation-adjusted high in gold (according to shadowstats.com) would be over $8,000 and silver would be over $400. We have a ways to go in this precious metals bull market. It is possible to exceed those numbers if a panic should occur or the US dollar should completely collapse. There is every reason to believe that this gold cycle will be more spectacular than the 1970’s, since more global investors (Asia) will be involved. What to do if you don’t have physical gold and silver? Here are some things that groovygirl is doing, you may be doing other things or have additional ideas. The main point here is to take some sort of action. Holding cash to cover at least 6 months of living expenses. Some cash at home in a secure safe and some divided across three different banks. If you have a business, the same thing applies. Food, water and essential prescriptions supply for at least 6 months. 20% of total worth in physical gold and silver held in several private vaults, such as Brink’s. If you have a large amount of gold and silver, some should be held outside of the US. If you have stocks, hold the actual paper certificates issued in your name. (For more information on the reasoning behind this statement, which is too lengthy to go into here. Please check out those posts about the MF Global bankruptcy. Click here. Start investing in an infrastructure that is as self-sufficient as possible in your present conditions, such as a geodesic dome, solar and wind energy at your present location. This is a starting place. This magazine also has great ideas. And, of course, google. If you are unhealthy or over-weight; get healthy. The less you spend on health care and life-long meds, the cheaper your monthly expenses will be now and during your retirement years. The healthier your body is; the better your mind can handle any stressors. Prepare your mind for the coming paradigm shift. I would be less pessimistic about the coming close to this long debt-creation cycle, if I thought the powers-that-be, on all sides-of-the-aisles and in all counties, actually acknowledged the global debt problem. The altered formulas, flat-out lying, and continuing bailouts prove they do not. They are firmly committed to continuing the status quo as long as possible without any regard for the damage it might do in the end. So, it will be up to individuals and communities to sustain themselves during this paradigm shift and create new sustainable systems. The entire global economy is based on debt. Any major contraction of debt means a complete paradigm shift in everything we do as a society from growing food to creating electricity to transacting business across seas…every modern system depends on debt and the liquidity of money. We have a once-in-a-century opportunity to create a structural social and economic frame-work that Bucky Fuller would be proud of. First, prepare yourself and your family; then together let’s start solving for a calculation that does work!